Let’s talk about belief first, that you think something is true. Clearly there is a difference between the statements “I believe in one God…” (the Credo) and “I believe it’s going to rain tomorrow.” An obvious difference is what one is willing to do or to pay to act on one’s belief. The Christian martyrs were willing to suffer and to die for their beliefs’; ‘ you might be willing to bet five dollars that it will rain tomorrow, but not your life, no matter what the weather forecast is. Accordingly, there are degrees of belief, which in fact can be quantified using various techniques in subjective probability and decision theory (see “Probability and the Art of Judgment” and “Subjective Probability–The Real Thing” by Richard Jeffrey). To explore these methods in detail would require another book, but those interested can go to the Stanford Encyclopedia of Philosophy articles . Now can one “fake it until you make it” as Pascal suggests? Or will the sacraments be ineffective, because the motive of the recipient is mercenary? Which of the Catechism dicta below are appropriate? So we can see that belief, as manifested in faith, is not an absolute, a two-valued yes or no, but a quality that is measured on a continuous scale, and that can be implemented by other than strictly rational means. As the quote from St. Augustine puts it, faith is belief in that which is not confirmed by direct evidence from the senses. On the other hand, what about revelation, such as the vision St. Paul had on the road to Damascus? That is surely a personal experience, not experienced directly by others. Revelation—the direct word from God or His messengers, the Angels—is not confirmable. 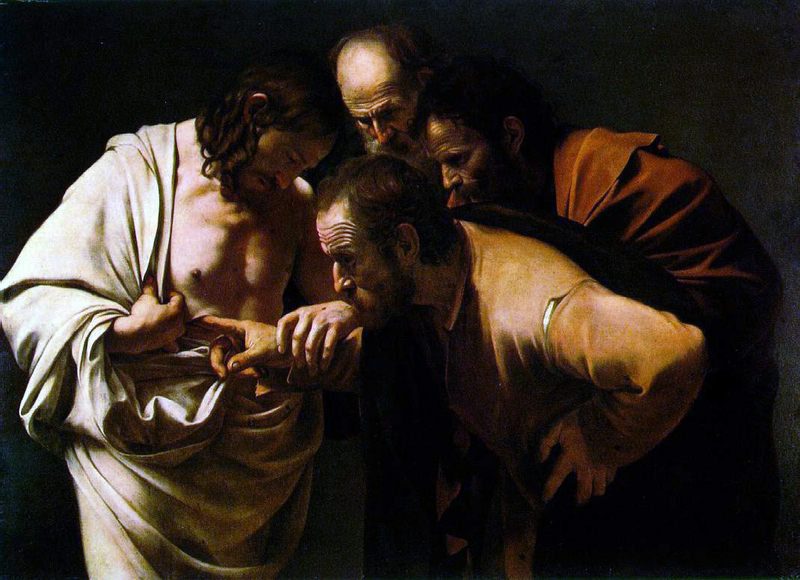 It happens once, and even if it happens to more than one person (as in the descent of the Holy Spirit at Pentecost), one still has to believe the word of those to whom it occurred. I’ll put this another way: the fundamental question we ask is “Why are we here?” Science might be able to say how our physical bodies came to be here, but science can’t answer the question: “Why did we come to be. Science would respond: “that question is meaningless, can’t be answered by scientific methods.” Only faith can give a satisfactory answer to that why question. In the next section, “Rational Inquiry,” we’ll explore the different methods by which come to believe by reason: logic to determine what kinds of statements are true; factual exploration to determine what is real. We’ll also see what limits there might be to such methods. Major Premise: All cows are purple. Minor Premise: This animal is a cow. Conclusion: This animal is purple. If you know the premises to be true, then the conclusion is true. If the premises aren’t generally true (as in this example), then the conclusion may or may not be true. For example, you could paint a cow purple, or it could be a mutation. Minor Premise: This animal is purple. Conclusion: This animal is a cow. Venn diagrams can help us understand logic problems, as shown in the diagram above, where several types of logical propositions are classified according to the corresponding Venn diagram. To make this example concrete, let “S stand for “cows” and “P” for “purple animals.” Accordingly, the “SaP” proposition is “All cows are purple (animals);” the white space means some purple animals are not cows and the black space means there aren’t any cows that aren’t purple. 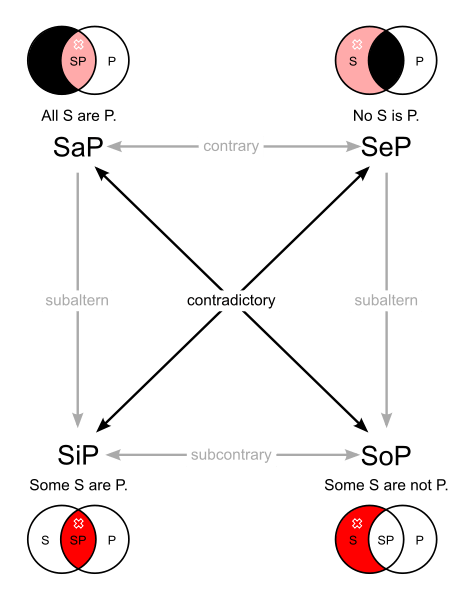 The “SeP” proposition is “No cow is purple;” the black space where the two circles overlap shows that there aren’t any animals that are both purple and a cow. The “SiP” proposition is “Some cows are purple;” there are cows that are not purple (white space in the “S” circle) and cows that are purple (red space where the S and P circles overlap) and purple animals that are not cows (white space in the P circle). The SoP proposition is “Some cows are not purple (animals);” the red space of the S circle. You can see (I hope) that the major premise of both syllogisms corresponds to SaP, and since there is a white space in the P circle (purple animals), there are some purple animals that aren’t cows, so the second syllogism can’t be true. 1. All babies are illogical. 4. All babies are despised. 5. No baby can manage a crocodile. “The only people in the cereal cafe are from Stoke. Every person would make a great Uber driver, if he or she is not allergic to gluten. When I love someone, I avoid them. No one is a werewolf, unless they have orange skin and blond hair. No one from Stoke fails to Instagram their breakfast. No one ever asks me whether I prefer Wills to Harry, except the people in the cereal cafe. People from Thanet wouldn’t make great Uber drivers. None but werewolves Instagram their breakfast. The people I love are the ones who do not ask me whether I prefer Wills to Harry. Such complicated problems often may require computer methods for their solution. Some of the statements (premises) may be redundant and some may be contradictory. The type of analysis required to make sure that none of the statements are contradictory, so that no paradoxes will occur, is a sub-discipline in mathematical logic,“satisfiability theory”. Question: Is this statement true or false? If it is true, then Epimenides is a liar, but if Epimenides is a liar, how can his statement be true? Both paradoxes invoke self-reference, whence the paradox. Bertrand Russell attempted to deal with the problem of self-reference by his “Theory of Types,” which sets up a hierarchy of statements, i.e. statements about statements, statements about (statements about statements), etc. Let’s look next at another rational path, induction or inductive reasoning. The results aren’t as sure, but it still is a basic route to judgment in law, science and everyday life. Induction is generally regarded as proceeding from particular instances or events to a general conclusion. (I’m not referring in this context to the mathematical method of proof.) Here’s an example. 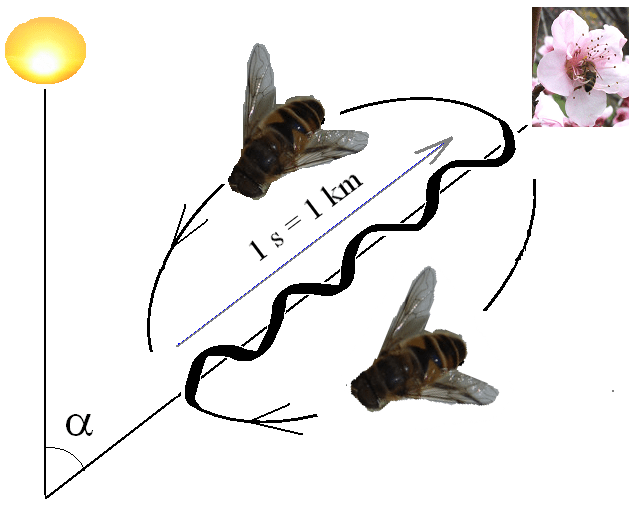 Here’s a neat video of bees doing the waggle dance. There are methods of assessing inductive reasoning propositions by means of probability statements, strength of belief quantification, and by Bayesian probability analysis. –Sherlock Holmes, The Sign of the Four, Chapter 6. One of the best known examples of abductive reasoning is given in the quotation above and indicated by its commonly used name, “Inference to the Best Explanation” or “IBE.” IBE uses given data to infer the most likely explanation of a past event that could have caused the data. It is commonly used in the so-called “historical sciences” (geology, paleontology, cosmology) for which laboratory experiments aren’t in order. You look out your window and note that your driveway is wet; three possible explanations occur to you: it has rained, the sprinkler has been set so that it also wets the driveway, your car has been washed. You notice that neither the street nor your lawn are wet, so you conclude that the third explanation—your car has been washed—is the correct one. A pail of water beside your car is confirmatory evidence for that conclusion. 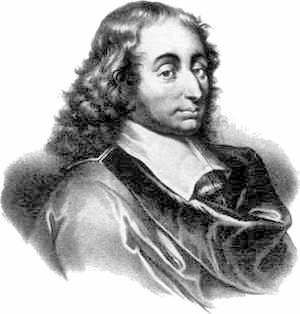 Some philosophers of science put down IBE as lacking certainty and leading to false conclusions. In the past theories proposed as best explanations have turned out to be duds: phlogiston as caloric fluid for heat, ether as a medium for electromagnetic waves. However, it should be kept in mind that these theories were disproved by additional empirical evidence: caloric theory of heat, by Count Rumford’s cannon-boring experiments, the ether as a medium for electromagnetic waves, by the Michelson-Morley experiments. See “Science Background—Elements of Thermodynamics,” for a more detailed account of how science works to prove IBE type theories. Retroductive reasoning is commonly used by scientists to explain phenomena by a familiar model. A very early example is that in which Galileo proposed that the moon had seas and mountains on it just as does the earth, in order to explain the differing patterns of light and dark on the moon at different orientations with respect to the sun. 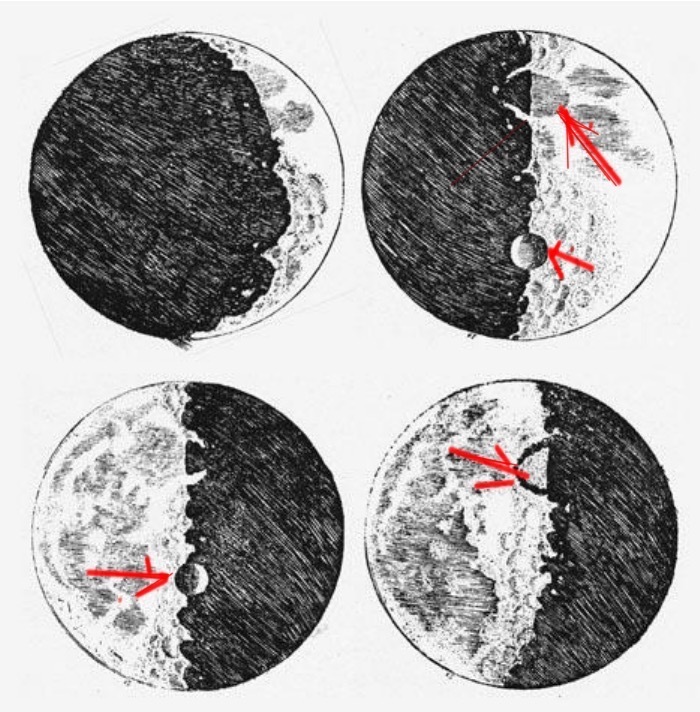 “Galileo’s Moon Sketches; red arrows show different shadows and light, depending on the direction of sunlight; these light and shadow patterns suggest the presence of mountains and craters. Model for vibrating molecules: a harmonic oscillator, a weight attached to a spring. “If this animal is a cow, then this animal is purple” (true if the major premise of the syllogism, “all cows are purple,” were true). —Fr. Stanley Jaki, The Limits of a Limitless Science. Why should the laws of nature “be written by God in the hand of mathematics” (Galileo)? Where does “The unreasonable effectiveness of mathematics in the natural sciences” (Eugene Wigner) come from? I’ll discuss possible answers to those questions in this Section (or why there might be no answers). As a onetime practicing physicist, I never bothered about why science works. It was only after retiring that I began to wonder about the philosophical ground on which science rests. Delving into texts, I found there were two main camps of philosophers of science: realist and antirealist. A summary of my blog post about the realists and antirealists, Tipping the Sacred Cow of Science—Confessions of a Science Agnostic, is given below. Scientists and philosophers who are “scientific realists” believe there is an underlying reality corresponding to a scientific description. Thus, they believe that the so-called “God particle”, the Higgs boson, is real, even though its existence is inferred from theory and high energy particle scattering data. It should not be surprising that most scientists are scientific realists. 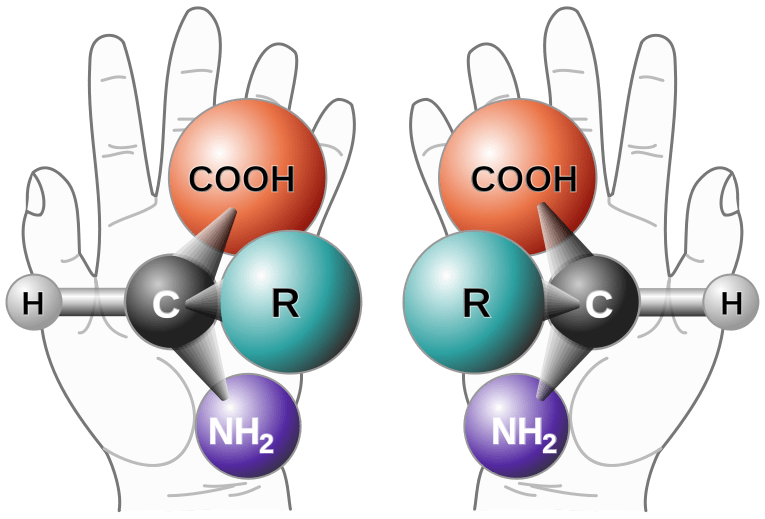 Why would a molecular biologist spend his life exploring the mysteries of the human genome unless he/she believed that this was a “true” explanation of how molecular chemistry expresses itself in heredity and our biology? Why would I (when I was an MRI physicist) have spent too many hours per day wondering how the state of biological tissue affected the environment of water protons, unless I believed that protons existed and that their magnetic properties depended on physical interactions with their tissue environment? To most of us scientists it’s more than a game; it’s a passionate desire to know how nature operates, and for those of us who believe in God, to understand His wisdom in Creation. Antirealist philosophers deny the fundamental reality of scientific theories/laws/entities and claim that science is validated only empirically, by the truth or falsity of the predictions derived from scientific theories. For these “antirealists” there are no scientific laws, and the reality of theoretical entities–quarks, gluons, etc–is problematic. According to them, scientific theories do not mirror reality, veiled or unveiled. 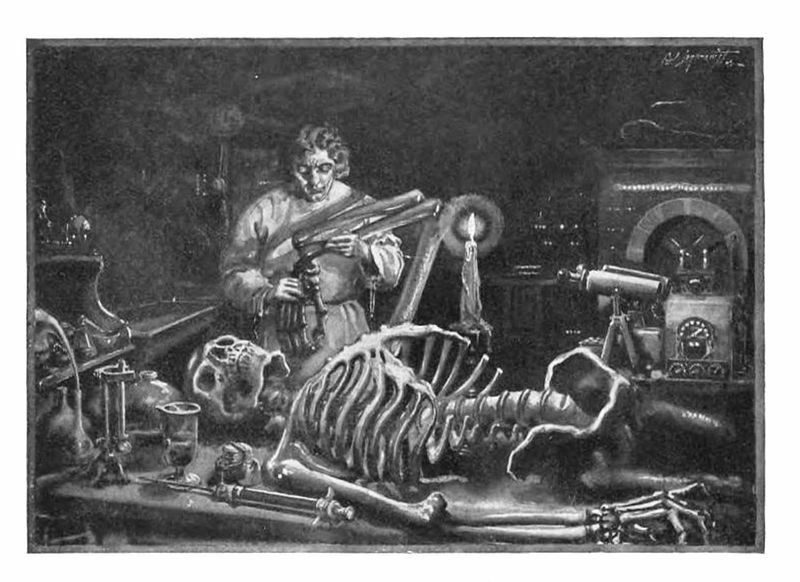 Their philosophical positions are illustrated by Nancy Cartwright’s How the Laws of Physics Lie, and Bas van Fraassen’s The Scientific Image, discussed below. Nancy Cartwright does not believe that fundamental, theoretical scientific equations are true (e.g. Maxwell’s equations, the Schrodinger equation), although she does believe that theoretical entities are real (e.g. the electron, quarks), and that phenomenological equations are true (relations empirically rather than theoretically derived, such as Poiseuille’s Law of viscous flow). Her reason for disbelief, supported by a number of examples, is stated in the quote above. The equations have to be amended, supplemented, supplied with empirical fudge factors, or require conflicting mathematical prescriptions to describe real situations. I won’t go over all her examples (Snell’s Law of refraction, Crooke’s radiometer, quantum damping, the BCS theory of superconductivity) but only say they are well chosen to demonstrate her knowledge of mathematical physics. The antirealists looking at the history of science, see failed theories, theoretical entities disproved by experiment–phlogiston by Count Rumford’s cannon-boring experiments, the ether by the Michelson-Morley experiment. On the other hand, one could argue that theory is converging to the truth–the Higgs boson confirmed by the CMS experiments—even though that convergence is an article of faith. Establishes a research program consisting of a network of hypotheses and experimental data: core theory, based on inner core principles, linked to secondary theories and results (Lakatos’ scientific research programme—see below). An inner core of fundamental principles--not theories, but principles to which theories have to adhere; these principles are assumed, because they seem obvious and confirmed generally by our experience: for example, The First and Second Laws of Thermodynamics. But, as we’ll see below, there are occasions when these fundamental principles are modified or violated. A shell of primary or fundamental theories surrounds this core of fundamental principles (e.g. thermodynamics, general relativity, quantum mechanics). Other shells representing auxiliary theories surround this shell of fundamental theories; such auxiliary theories are derived from the primary theories and other auxiliary theories; MRI, chemical bonding, heat transfer are examples of such auxiliary theories. Finally there is an outermost shell of experimental facts or data. The interplay between the shells and core that shows how science works is described in the diagram below and illustrated by several examples in 3.4 How Does Science Work? Case Studies. 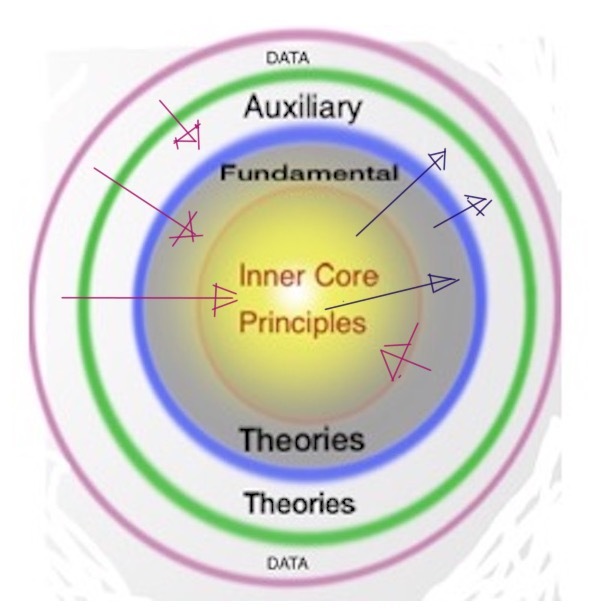 In this diagram the inner core principles are linked to fundamental and auxiliary theories, as shown by the black arrows. There is feedback from data to theories, as shown by the red arrows. There is even feedback from data and fundamental theories to inner core principles, as shown by the red arrows. Examples of how the Lakatos scheme works are given below. History of Thermodynamics: Count Rumford: Cannon Boring —> Heat Not Conserved. In 1798 Benjamin Thompson, Count Rumford, submitted a paper to the Royal Society about his experiments in which boring a cannon could make water boil, and boring with a blunt instrument produced more heat than with a sharp one (more friction with the blunt). The experiments showed that repeated boring on the same cannon continued to produce heat, so clearly heat was not conserved and therefore could not be a material substance. This experiment disproved the then prevalent theory of heat, that it was a fluid transmitted from one thing to another, “the caloric.” The results validated another theory of heat, the kinetic theory, in which heat was due to the motion of atoms and molecules. However the kinetic theory, despite Rumford’s groundbreaking experiment, still did not hold sway until years later, after James Joule showed in 1845 that work could be quantitatively converted into heat. As the weight falls, the potential energy of the weight is converted into work done (a paddle stirs the water in the container against a frictional force due to water viscosity). The temperature rise corresponding to a given fall of weights (work done) yields the amount of heat rise (in calories) of the known mass of water. Since the temperature rise is very small, the measurements have to be very accurate. It took 30 to 50 years after Joule’s definitive experiment (and subsequent refinements and repetitions) for the kinetic theory of heat—heat caused by random, irregular motion of atoms and molecules–to be fully accepted by the scientific community. James Clerk Maxwell published in 1871 a paper, “Theory of Heat“. This comprehensive treatise and advances in thermodynamics convinced scientists finally to accept that heat was a form of energy related to the kinetic energy (the energy of motion) of the atoms and molecules in a substance. The core principle involved in the caloric theory of heat was the conservation of caloric (since it was a substance). Count Rumford’s cannon-boring experiments showed that the more the cannon was bored, the more heat was produced; therefore the supply of heat in the cannon was inexhaustible and clearly not conserved. A core principle involved in Joule’s experiment is the First Law of Thermodynamics: conservation of energy, with heat and work as forms of energy. Note that this conservation principle is linked to the fundamental theory of thermodynamics developed in the middle of the 19th century and earlier, theories of classical mechanics developed in the 18th century and early 19th century. Recently Einstein’s Theory of general relativity has been confirmed again from LIGO measurements of gravity waves. See “Peeling Back the Onion Layers—Gravitational Waves Detected” for a more detailed account. Conservation of parity (handedness) had been a fundamental principle of physics until the late 1950’s, when a proposal to test it for nuclear weak force interactions–e,g, beta decay of Co-60 nuclei–showed that it was violated. (See here for an expanded story.) Since that time a conservation principle, CPT symmetry, linking parity (P) with charge (C) and time reversal (T) has been found to hold. How do we go from “how science works” to “what science can’t do”? The most comprehensive scheme and, to my mind, the one that best matches actual scientific practice is that of Imre Lakatos, described above. Note again these elements of the scheme: a network of hypotheses AND experimental data. The combination of theory and data requires that predictions or explanations made by models and theory must be validated empirically, if the theory or model is to be truly part of science. Measurements must be replicable, which is to say that essentially the same results are required, for whichever team does the measurement or performs the experiment. This need for numerical assessment strikes out disciplines which most people would regard as science—biology, geology, paleontology, and such. Here I would have to disagree with Fr. Jaki: abduction and retroduction can be used to assess non-numerical data rigorously. A fine example is the development of the tectonic plate theory. It started in 1915 with the continental drift hypothesis of Alfred Wegener, based on the matching coastline shapes of western Africa and Eastern South America, and the striking similarity of strata and fossils on the two coasts. In the 1960’s seismographic data showed that continents and ocean floors rested on vast tectonic plates which were vehicles for continental drift. So, both qualitative and quantitative evidence entered into validation of the theory. What this means is that science can not explain itself. Science can not show why it gives us a partial picture of the world expressed mathematically, or to use the Nobel Laureate Eugene Wigner’s apt phrase, science can not explain “the unreasonable effectiveness of mathematics” by an underlying scientific theory. The only justification for this success is empirical—it works! Therefore science can not answer questions about religion. It cannot neither prove nor disprove the existence of a Godhead, nor the existence of the Trinity. Thus, to say that science “proves” the existence of God, is as much an error as saying it disproves that God exists. We can only say that all that we learn about our world from science is in accord with that world which an omniscient and omnipotent God would create.